My latest pickup arrived in the mail today. 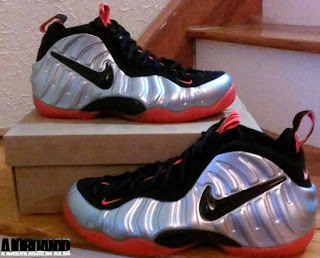 The metallic platinum/bright crimson Nike Air Foamposite Pro. Still looking for a pair, click here to buy them on eBay. Released this past Friday, August 31st. These sold out instantly. Luckily for me, I was able to get a pair for myself. Shout out to SoleElite.com for helping me out once more. I will have some detailed images up soon but for now, enjoy this pic. If you're still looking for a pair, follow this link to grab a pair from Sole Elite or if your size is sold out, check out InstyleShoes.com or, find a pair on eBay .